Despite the look of the posters (which didn't attract me at all), this is a fun rollicking movie that'll have you rolling in your seats. Straight away the film captivates with striking colors in sharp beautiful 3D Imax. It's big and it moves well -- not just the pace, but the virtual camera through each scene. The characters are likeable and the film has something every good picture needs -- a really good bad guy. And who else to fit the bill in a film about animals, than a true blue, pick-up drivin', rifle totin', all American country hunter. His movements and facial expressions are animated to caricature perfection. Besides all the silly romping and ribbing going on, the film sports two "created especially for 3D" scenes that burst with sugar -- they feel like an amusement park ride: 1) The busting up the convenient store scene and 2) The breaking the dam sequence -- both a whole lot of fun. The only imperfection: At the end of the day, this is a buddy film and the writers never really sell the buddy relationship. If you like this sort of thing check out Madagascar. WIN a FREE Book signed by Ross Anthony! 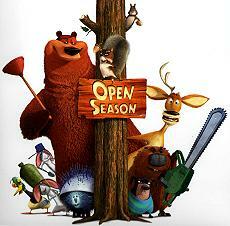 Open Season. Copyright © 2006. Starring Martin Lawrence, Ashton Kutcher, Debra Messing, Gary Sinise, Billy Connolly, Jon Favreau. Directed by Jill Culton, Roger Allers, Anthony Stacchi. Screenplay Steve Bencich & Ron J. Friedman and Nat Mauldin. Produced by Michelle Murdocca at Columbia Pictures/SonyPicsAnimation.